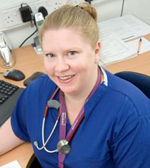 Dawn Adamson is an interventional cardiologist whom specialises in obstetric cardiology. Having completed general medical training, she went on to gain a PhD in cardiac physiology at the National Heart and Lung Institute, Imperial College. She remained in London for her specialist registrar training and worked at the Royal Brompton, St Marys and Hammersmith Hospitals. Whilst in her second year of trianing, under the mentorship of Prof Roger Hall, she became interested in the management of heart disease in pregnancy and extended her training in order to join Prof Cathy Nelson-Piercy in Queen Charlottes one day a week. She went on to be awarded an Interventional Fellowship at the Hammersmith hospital before taking up a joint consultant post with Queen Charlottes. She has lectured both nationally and internationally on the subject and is a member of the European Society of Cardiology expert panel of Heart Disease in Pregnancy. Recently, with Miss Mandish Dhanjal and Prof Cathy Nelso-Piercy, she has written the Oxford Handbook of Heart Disease in pregnancy.